The Condor Trek is said to be the most beautiful trek in Ecuador. Even though physically demanding the aid of packhorses along the entire route make it accessible to almost everyone. 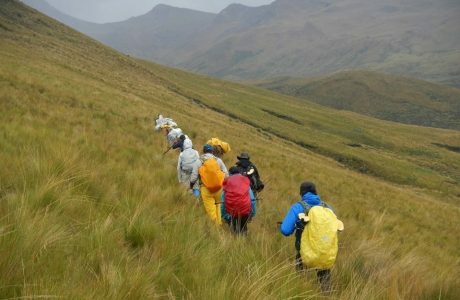 The Condor Trek runs across three ecological reserves and protected areas: the Cotopaxi National Park, the Antizana and the Cayambe Coca Reserve. This treks will lead us along the highlands of the Cotopaxi, Sincholagua and Antizana mountains to finally reach el Tambo which is one of the gates to the Amazonia. On clear days trekkers will enjoy the magnificent view of the Cotopaxi and Antizana- perhaps the two most beautiful snow-capped volcanoes of Ecuador- as well as breathtaking views of the Ecuadorian Andes. 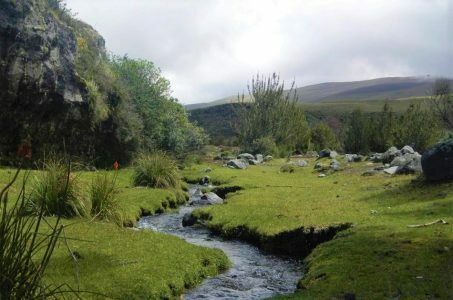 This trek will consistently lead us through the paramo thus offering to trekkers a complete glance of its very particular vegetation and fauna. If lucky, we may be even able to admire the flight of the condor, the spectacular bird this trek is named after. On our way, we will cross rivers, water streams and will camp aside lagoons. For a gently ending, this trek proposes a warm bath in the spring terms of Papallacta, a nearby town from our arrival point. Altitude: This is a high altitude trek which permanently stands above 3.600 m.s.n.m. 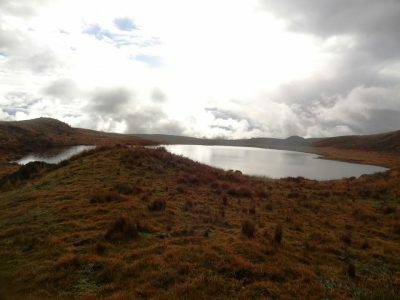 The starting point is Tambopaxi located at 3.700msnm and the arrival point is El Tambo at 3.644msnm. 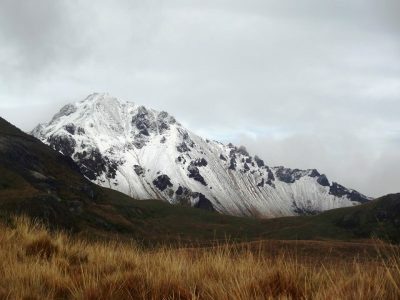 The highest points are the Sincholagua pass at 4.429msnm and the valley at the base of Antisana at about 4.400msnm. Best time to visit: From June to January. Observations: This is a very challenging and physically demanding trek. If raining, mud slogging and cold may add some extra difficulties to the trek. Even under the more ideal conditions water streams keep parts of the route muddy all year around. Weather in the Sierra may be very changing regardless of the season. Raining boots are a must. *The trek maybe also done in the opposite direction: Starting at El Tambo and ending at Tambopaxi. This is nevertheless a slightly more demanding option. We also recommend considering staying overnight at the spring terms of Papallacta. **If the weather turns nasty this trek may become difficult because of mud slogging and cold conditions. However, the dry season usually lasts from June to January and weather tends to be stable during this time of the year. Keep in mind, however, that the weather is becoming increasingly unpredictable. Day 1 Private Transfer to Quito – Cotopaxi National Park – Taracocha Lagoon. Day 2 Taracocha Lagoon – Antizana. Day 3 Antizana – Santa Lucía lagoon – Tuminguina Lagoon. Day 4 Tuminguina Lagoon – El Tambo – Private transfer to Quito. Day 1 – Private Transfer to Quito – Cotopaxi National Park – Taracocha Lagoon. 6:30: We leave from Quito and head south for a nearly two hours ride to the Cotopaxi National Park. 8:00: While our mule drivers (arrieros) load our baggage and gear on the mules, we will have breakfast at one of the Eco-lodges at the Cotopaxi National Park. 9:30: We begin our trek heading northeast to the Sincholagua mountain. This first day of the trek will last for about six to seven hours. We will start at 3.700: meters to ascend to the pass of the Sincholagua Mountain at 4429 meters prior to descending again on its east side to camp at approximately 3.900 meters. Our trek starts with an easy walk on a relatively flat terrain leading to the River Pita and to the valley of “La Merced”. The second portion of the trek involves a nearly constant and demanding ascent to reach the col of the Sincholagua at 4.429 meters. This is the highest point of the entire trek. We will then go along the edge of the mountain to start our descent on its east flank. By the late afternoon, we will reach the Taracocha Lagoon where we will set up our campsite. Day 2 – Taracocha Lagoon – Antizana. We will wake up early in the morning to pack the camp up. After breakfast, we will head directly to the base of the Volcano Antisana. Day second of the trek involves about a six to seven hours hike on usually dry terrain but not exempt from river and water streams crossing. This part of the trek is considered the best place to spot Condor. Most of the hike takes place in a broad valley that begins at the base of Sincholagua and ends at Quebrada Pullirima Viejo. From this point, we will start a gentle ascent, walk past the Micachocha Lagoon and reach our destination of the day at the bottom of the Antizana. We will camp aside from the old and pitifully nowadays ruined hacienda house where Alexader Von Humboldt stayed during part of the time of his visit to Ecuador. Day 3 – Antizana – Santa Lucía lagoon – Tuminguina Lagoon. After breakfast, we pack the camp up and continue our trek. The first part of the trek goes through a broad valley along the edge of the Antizana. In about three hours we reach the Santa Lucía lagoon located just between the lava´s peaks of Antisanilla and the Antizana volcano. This first section of the trek is also known as a good location for condor spotting. From here onwards the vegetation drastically changes as we start our descent to the Tuminguina Lagoon. We will make our way downslope through grassy vegetation at first and then through a narrow cloud forest band. By the late afternoon, we will reach the beautiful Tuminguina lagoon, our last campsite. If weather allowing we may have a cold but refreshing bath in the lagoon. We may also explore the lava field at the north side of the lagoon. Day 4 – Tuminguina Lagoon – El Tambo – Quito. This will be the shortest but the muddiest part of our trek. Overall, day four involves a moderate four- five-hour hike. We will begin by climbing the steep slope on the north edge of the Tuminguina lagoon. Afterwards, we will reach a countryside composed mainly of grassy hills, dirt and patches of polylepis. Once the base of the flat-topped hill of El Tambo is reached the trail smoothly starts its descent to the river of the same name. From here the terrain gradually gets wetter and muddier as we approach the Rio Tambo and its broad valley. By midday, we should be arriving at our final destination where our transportation will be waiting for us. We will then drive to the nearby spring terms of Papallacta. After a well-deserved bath and a dinner, we will return to Quito. We should be arriving at the capital at around 7 pm. Food and beverages during the trek.